My first book of nonfiction came out this week. You can get Nothing now at Amazon, SPD, stores, etc. MOM: What do you say when someone gives you something you want? 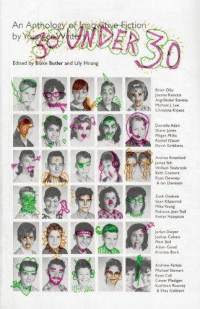 "30 Under 30 offers an impressive cross-section of innovative American fiction by young writers. 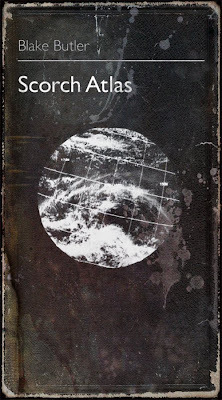 If you're tired of the 'authorized version' and want a sense of where fiction is really going, what its future shapes and forms are likely to be, this is the place to start." - Brian Evenson, author of Fugue State and The Open Curtain. 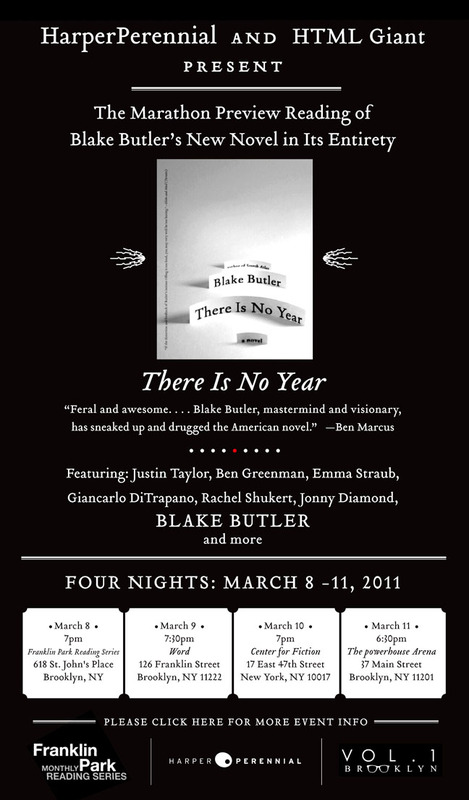 Going out for a little stretch on the road to do reading junk from There is No Year; if you are nearby, would be rad to hang out! Seems wild to already be at April 5 2011, but here we are. There is No Year is available widely, including online at several places found here. Amazon has it for like less than $9, and there are the brick stores that are alive. 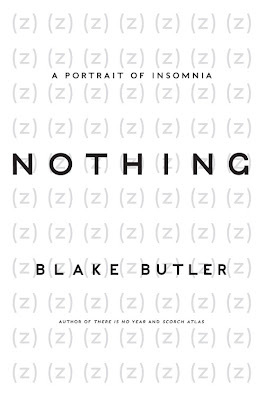 "Blake Butler, mastermind and visionary, has sneaked up and drugged the American novel. What stumbles awake in the aftermath is feral and awesome in its power, a fairy tale of an ordinary family subjected to the strange, lonesome agony known as daily life. There is No Year is a merciless novel cleansed of joy, pumped full of fear and awe." Thanks again to all who've done so much for me and continue to do so much. I couldn't feel happier. I hope you'll check out the book if you feel it. "In fantasies of romance it was she who fought and overcame thereon to rescue some object or figure that never in the reverie resolved or took to itself any shape or name." 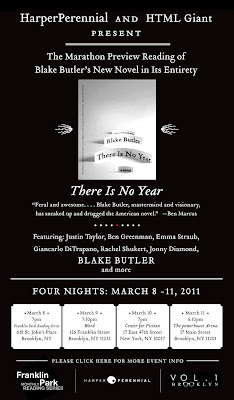 A family lives in a house in which strange things start to happen (or—it’s a new novel by Blake Butler). 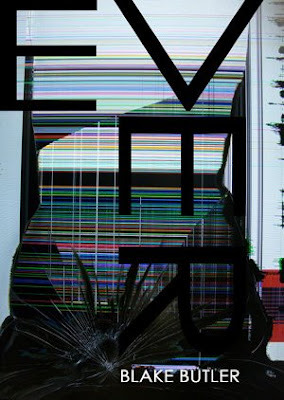 Love him, hate him or feign indifference: There’s really no other way to react to the work of writer/postmodernist/multi-hyphenate Butler (Ever, 2009, etc). 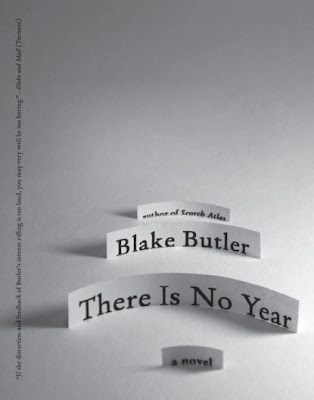 For those who like their prose fresh out of a cleaner and more traditional wellspring, Blake’s writing can prove tedious at best and arduous at worst. But for those who lean toward writing that is more visceral, taxing or outright demanding of the reader, this might be the right cup of tea—see Mark Z. Danielewski’s House of Leaves (2000), to which this novel owes some debt. The book concerns a family of doppelgängers so featureless that Butler doesn’t bother to give them names (or more accurately, likely purposefully washes them out to their elementary characteristics). So, the father, the mother and the son live in a house, just like the carbon copy father, mother and son had done before them. The father stares at a computer screen. The mother stares at her lined face in mirrors and thinks protective thoughts about her son, who suffers from a disease that nearly ended his life. The son goes to school, makes a friend and watches television with his family. It’s all presented in hushed, monochrome language that gives the whole enterprise a sense of menace from the beginning, even before Butler introduces the father’s paranoia that things in the house are changing without his knowledge. And then things do start changing. A gruesome slice of familial oddity that demonstrates its author’s versatility. "When the notes were all burned, all that writing, as Franz expressed himself, he, Wertheimer, called up Salzburg and ordered the piano and Franz distinctly recalled that during this telephone call his master kept insisting that they send a completely worthless, a horribly untuned grand piano to Traich. A completely worthless instrument, a horribly untuned instrument, Wertheimer is supposed to have repeated over and over on the phone, said Franz."